Josh Smith is a mechanical engineer from Virginia Tech and is also the founder of Handizap. Handizap’s goal is to “create products to help make the lives of the disabled a little easier.” The company’s flagship product, coined the “Sixth Digit Stylus,” is unlike any other stylus currently on the market. The original Sixth Digit prototype was created with the plastic ring of a Ring Pop and an eraser. Shortly after the development of the prototype, Josh received a lot of interest from therapists, patients, and doctors. He and his friend, Jared Rhodes, decided to team up and launch a Kickstarter campaign to raise funds to manufacture the Sixth Digit for other quadriplegics and others who may benefit. 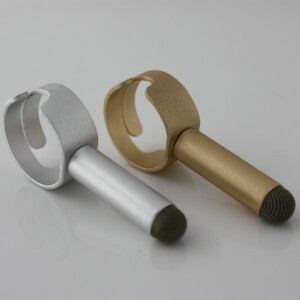 Currently, the Sixth Digit is the “only stylus ring with a short stylus tip attached to it in the world!” It features an easily removable metal mesh tip for increased responsiveness and durability; a stiff stem for pressing buttons; and an adjustable ring to fit several differently-sized fingers. The Sixth Digit features a 1-inch stylus tip which allows the user to navigate any touchscreen device. It can also help users type on the traditional keyboard, or press buttons they may come across daily. The ring’s sleek design allows for the ring to be worn all day without getting in the way. To learn more about Handizap and the Sixth Digit, like the company on Facebook or visit their website.